Dijon  is the capital of the eastern French region of Burgundy. Dijon is perhaps best known for its mustard (named after the town), which is no longer produced locally, but it is still one of the most beautiful cities in France, and its historic buildings and byways were not heavily damaged by bombing in World War Two and are largely intact. Today, Dijon is a cosmopolitan city, with universities in the centre and industrial plants on the outskirts. Traffic is restricted in the centre of the city, so many parts of central Dijon are quiet and relaxing. While perhaps not an ideal city for a whole holiday, it's definitely worth stopping for a couple of days. April to September: Monday to Saturday: 9:30 a.m.-6:30 p.m., Sundays and public holidays 2:00 p.m.-6:00 p.m.
October to March: Monday to Saturday: 9:30 a.m.-1:00 p.m. and 2:00 p.m.-6:00 p.m., Sundays and public holidays: 10:00 a.m.-4:00 p.m.
April to September: Monday to Saturday: 9:30 a.m.-6:30 p.m., Sundays and public holidays: 10:00 a.m.-6:00 p.m. There is another one at the well of Moses. They have free maps of the downtown area, including a map and guide for the self-guided walking tour of Dijon. The walking tour uses a small brass pavement marker with an owl design to note the path along the sidewalks of Dijon. Larger numbered owl markers correspond to different stops on the tour, and the guide pamphlet will have descriptions of the art, history and architecture of that stop. The train à grande vitesse (TGV) speeds travellers from Paris (only 100 min) and other major French cities to Dijon. There are also regular train services to a variety of destinations, including, but not restricted to, Italy (Milan, Turin, Florence and Rome among them), Switzerland, Luxembourg and Belgium. There is also a special return ticket on the TER from Paris (Train Express Régional) that is slow (3 h) but costs only €18, and lets you spend 24hg in Dijon, including a saturday night. The train departs from Paris-Bercy on saturdays at 3.20 pm, arriving in Dijon at 6.14 pm, the return departs from Dijon on Sundays at 7:46 p.m., arriving in Paris-Bercy at 10:44 p.m. You can buy this at station ticket offices in Paris Bercy train station or Paris Gare de Lyon only. Similar trains leave Dijon Saturday morning for Paris and return in the evening. Dijon Bourgogne Airport ceased operations on 30 June 2016. From Paris Charles de Gaulle Airport (IATA: CDG) there are TGV high-speed train services from the railway station which is adjacent to Terminal 2 (station name: Aéroport Charles de Gaulle 2 TGV or Paris Aéroport Roissy Charles-de-Gaulle when booking online) to Dijon Ville station. The journey time for the direct TGV train is around 2 hours. Alternatively, take bus number 4 operated by Le Bus Direct (one-way ticket: €17 as of 2017) from the airport to Paris Gare de Lyon from which there are frequent TGV trains to Dijon. From EuroAirport Basel Mulhouse Freiburg (IATA: BSL) you can take bus number 11 (operated by Distribus)  to Saint-Louis railway station, and then take the train to Dijon (via Mulhouse Ville station). Alternatively, take bus number 50 (departs approx every 10 mins, journey time 20 minutes)  to Basel Bahnhof, from which there are TGV high-speed train services to Dijon (journey time around 1.5 hrs for the direct train). Dole – Jura Airport (IATA: DLE)  is served by low-cast carrier Ryanair (flights to/from Fes, Marrakesh and Porto). Dole is around 30 minutes by train from Dijon. A taxi from Dole railway station to Dole Airport costs around €20 and the journey takes around 15 minutes. Eurolines connects Dijon to some major European cities, mostly outside of France. Dijon is well connected to the freeway and highway networks. Note that traffic is limited in the centre of the city, so you will probably want to park your car for the duration of your visit, except to access the Well of Moses, which is on the outskirts of the city. For most people walking is still the best way to get around the center of the city. A comprehensive network of buses covers farther local destinations. If you want to get a bit outside of the downtown (like to get to the well of Moses) it's often easier and faster to use a bicycle. If you're here on a long term basis, there is even another service called DiviaVélo (€15 for one month). Buses and trams in Dijon are serviced by Divia. As of August 2016, a one way ticket costs 1.30 € (plus 30 cents for a reloadable card), 3.90€ for a 24 hour ticket, 6.85 € for a 48 hour ticket, and 8.80 € for a 72 hour ticket. The city offers the Diviaciti, a free, frequent shuttle bus for visitors that connects many of the downtown destinations in a loop, along with several parking areas. But be wary that the shuttle is only a minibus and is often congested with locals. If you happen to arrive by train, take note that the orientation maps can be a bit misleading. For some reason, maps are oriented with west, rather than north, in the upward position. There is a self guided walk in the city, called Parcours de la chouette, shown by owl arrows and numbered owl plates in the ground. There are 22 stops showing interesting stuff. The book with the description of stops is available at the tourist office for 3.50 € in many different languages. Junior version in French is 2.50€. Adult and child 5€. But it's not mandatory. 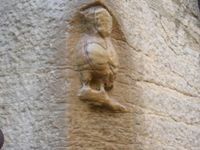 The owl (la chouette) is the icon of Dijon, sculpted on the side of the Notre-Dame church, perhaps as early as the 16th century, but mentioned for the first time in the 18th century. The story says it can grant you a wish when you touch it with your left hand when passing it from the left. There is a dragon hiding in the church window to the left of the owl, which supposedly eats your wish if you touch the owl passing from the wrong direction. Place François Rude (also known as Place du Bareuzai) is a central place with beautiful traditional houses, a fountain with a sculpture, an old carousel and a lot of cafés and bars. Popular among locals on summer days. The Ducal Palace (Palais Ducal), a beautiful building, has an important museum collection containing priceless treasures and art from Roman times through contemporary art. If you visit nothing else in Dijon, visit this museum (Musée des Beaux-Arts). Like almost all museums in Dijon, it is free. The Philippe Le Bon tower in the Ducal Palace. You can climb its 316 steps to have a view on Dijon. Though it will cost you €3.00 and it is limited to 19 people, only at restricted hours for security reasons. Palais de Justice (rue du Palais) built in the 16th century. Les Halles is an indoor market, designed by Dijon native Gustave Eiffel of Eiffel Tower fame. There are a lot of religious buildings in the city. François I said "c'est la ville aux cent clochers" ("it's the city of one hundred bell towers") when arriving in Dijon. The Well of Moses (Puits de Moïse), a splendid monument by Claus Sluter, is now on the grounds of a psychiatric hospital but can be visited nonetheless (opening hours). You can go there using a walking/cycling trail called the "Coulée verte"; see the Do stuff to know more. The cathedral (Cathédrale Sainte-Bénigne) was built in the 14th century and is a national monument. Notre Dame is a church from the 13th century, famous for its automaton clock, stolen in Coutrai (Belgium) in 1383. St. Michel church, which is east of the Palais des Ducs. It was built from the 15th to the 17th century. Most museums are free for everyone. English and french audio guide is available most of the time. The Musée des Beaux-Arts is an art museum, located in the Palais Ducal and has a permanent exhibition of medieval art. On the upper floor, there are lots of paintings by local artists and Flemish painters. The museum sometimes hosts temporary exhibitions of modern art. The most famous part of the museum is the Guard Room with tombs of the Dukes of Burgundy. On the top floor is more recent art including Picasso, Monet and Courbet. Museum d'histoire naturelle (in the Arquebuse gardens), hosts permanent exhibitions on animals, mummies, etc. Pavillon de Raines in the Arquebuse gardens hosts temporary exhibitions on scientific topics, animals, etc. The planetarium in the Arquebuse gardens have different showings on astronomy. Musée de la vie bourguignonne. Jardin Darcy (on the Darcy place) is a beautiful park near the station and it's a great place to have a rest and to see how French people enjoy themselves. (But before you sit down on a bench, you should make sure that there are no pigeons on a branch above you). 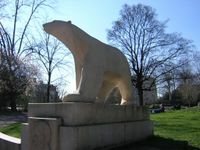 You can see the famous white bear of François Pompon (although this one is a replica made by Henri Martinet; the original is at the Orsay museum in Paris). The Arquebuse is a large garden, situated just below the train station, built in the 18th century on this place where Arquebuse knights met in 15th century. It contains the botanic gardens (Jardin Botanique), the museum d'histoire naturelle, the planetarium and the pavillon de Raines. Promenade de l'Ouche (or Coulée verte) is a walking and cycling trail which starts near the Hospital (rue du Faubourg Raines, 10 minutes walk from city center) and follows the Ouche river to the Kir lake. On the way to the lake you can stop at the Well of Moses (30 min walk). Lac Kir (Kir lake) is an artificial lake just bit outside the city. There you can walk or cycle around the lake. In the summer days there's plenty of people on the beach (you can swim in the lake, although the water is a bit dark). Rue de la Liberté, which extends east from Place Darcy to the Palais des Ducs is a main shopping street with all types of shopping for locals and visitors. The Boutiques Maille (for Maille mustards) is located on this street. Les Halles, an indoor marketplace, has many stalls for fresh produce, meat, and seafood. Dijon mustard is no longer produced in Dijon. In fact, 80% of the mustard seeds used to produce mustard in France is imported from Canada. Edmond Fallot is a independent family business that has been producing authentic Burgundy mustard (i.e., they use mustard seeds from Burgundy, not imported from Canada) since 1840. They have a boutique on Rue de la Chouette where you can taste their many mustard varieties, but their factory in Beaune sells them for a few cents cheaper. Many of the dishes that Americans think of as traditionally French originated in Burgundy: 'coq au vin'. Another great strategy is to order the fixed-price (prix fixe) menu, usually three courses including dessert and provides a good sense of what the restaurant is like. Jambon persille (terrine/meatloaf) and pain d'epices (gingerbread) are local delicacies of the region. There are 4 Michelin starred restaurants in Dijon and the immediate area. Dijon is well known for creme de cassis, a sweet blackcurrant liqueur that is a bright reddish-purple in color. If you are of legal drinking age in France a traditional Dijonnaise cocktail is called a "Kir", a blend of cassis and a local white wine (traditionally "Aligoté") - you can also order it made with champagne for a tasty and festive "Kir Royale". Make sure that you try the wonderful local wines - Burgundy has the highest number of Appellations of any french region. Of course the reds are terrific, and Americans unfamiliar with wine history might be surprised to find that white burgundies compare favorably with California chardonnays - they are, after all, from the same grape. Hotel Le Jaquemart--1 star, no frills, but clean, quiet and very pleasant. A quad room is €70. The location cannot be beaten! In the centre of the antique, pedestrian area. Excellent boulangerie across the street and a nice, little restaurant (serving only mussels and pommes frites) down the street-- both great at what they do and good value. Hotel Frantour des Ducs--3 star, €50-65 low season. Clean, centrally located at the end of the Rue de la Liberte. Les Langrons  A traditional stone-built cottage in the wineyards. 45 mins drive to Dijon. Ideal for a relaxing wine and dine holiday in a nice countryside. Weekly rental from 400 EUR/double room. The Local Tourist office runs walking tours of the town (with guides speaking both French and English). The Tourist Office has maps and pamphlets for the self-guided walking tour of Dijon. The Tourist Office is located on Avenue Marechal Foch, next to Jardin Darcy, and just two or three blocks east of the train station (Gare SNCF). A second Tourist Office is located on Rue des Forges, in the northwest corner of the Palais des Ducs. Beaune is a beautiful town with many wineries and excellent examples of typical regional architecture. In particular make sure you see the Hôtel-Dieu. You can reserve vineyard tours through the Dijon Tourist Office to visit the Cote de Nuits and participate in wine tastings in some of the most famous wine-making villages of Burgundy. This page was last edited on 5 January 2017, at 16:24.